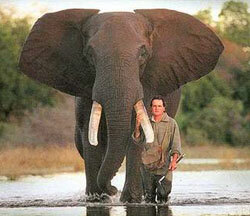 In 1986, Dan Harrison ( see picture above ) was on holiday in Kenya after graduating from Northwestern University. As carefully and as gently as he could, Dan worked the wood out with his hunting knife, after which the elephant gingerly put down its foot. The elephant turned to face the man, and with a rather curious look on its face, stared at him for several tense moments. Dan never forgot that elephant or the events of that day. Twenty years later, Dan was walking through the Chicago Zoo with his teenaged son. As they approached the elephant enclosure, one of the creatures turned and walked over to near where Dan and his son Dan Jr. were standing. The large bull elephant stared at Dan , lifted its front foot off the ground, and then put it down. The elephant did that several times then trumpeted loudly, all the while staring at the man. Dan summoned up his courage, climbed over the railing and made his way into the enclosure. He walked right up to the elephant and stared back in wonder. The elephant trumpeted again, wrapped its trunk around one of Dan's legs and slammed him against the railing, killing him instantly.